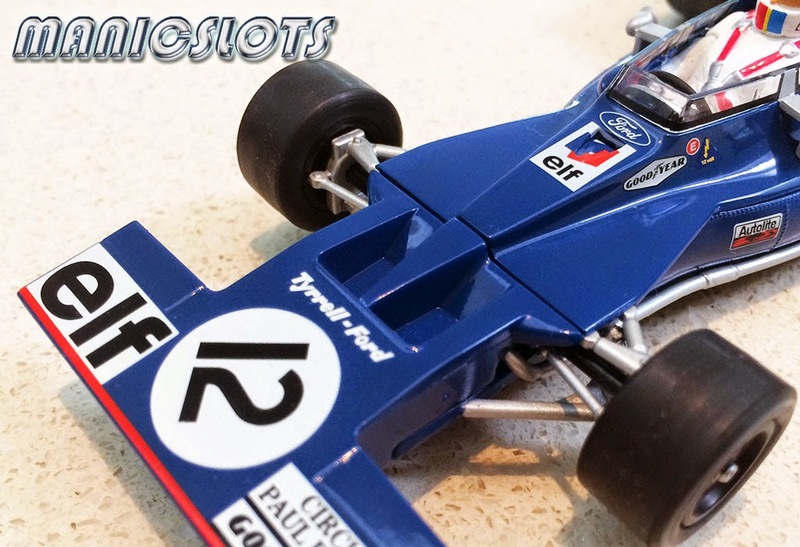 Eat, Sleep, Slot Car, Repeat...News, Reviews, Views and How-To's on everything slot car and scenery related! 10 April 2015 - 296,211 sloters (189,902 unique) from 196 countries have visited ManicSlots viewing a total of 684,176 pages with an average time on site of 2min 03sec - statistics provided by Google Analytics. Carrera Ferraris, classic Nascars, F1, GT and JTC. 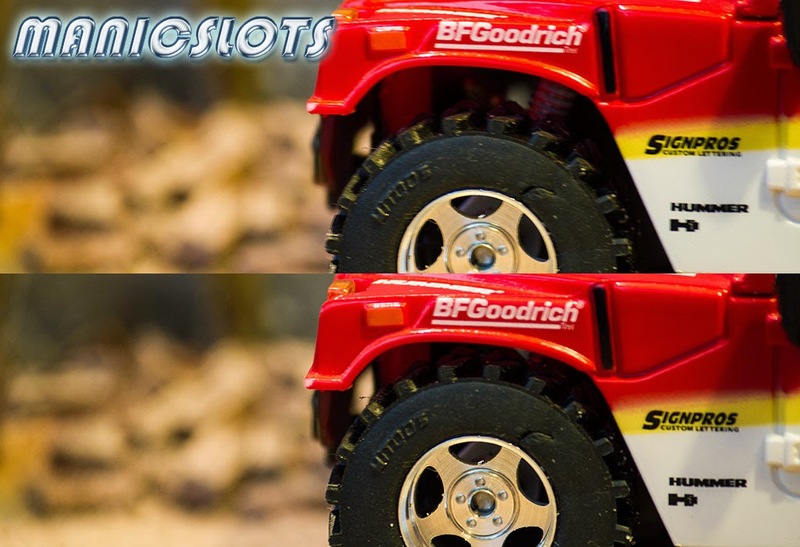 - Incredible value slots, you can get these from the UK, US, etc. for as little as $AU50. Scalextric Muscle Cars, (Mustang & Camaro) - Stunning performance and collectibility. 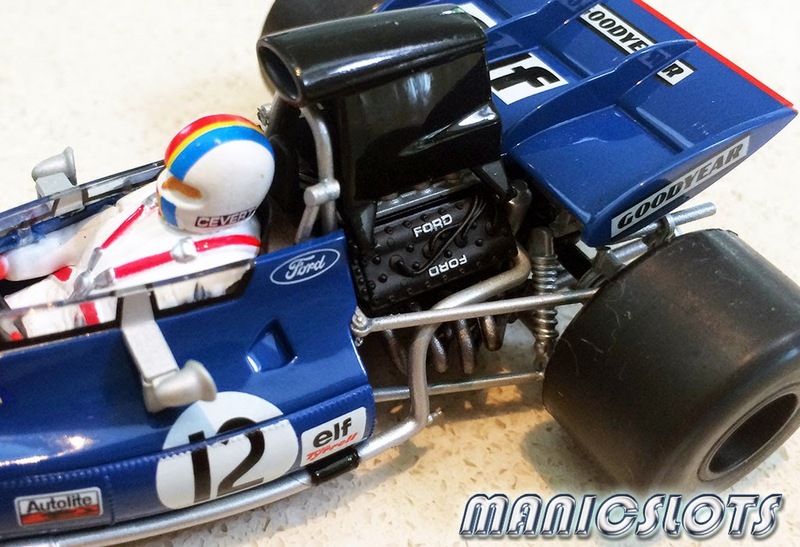 Scalextric Classic Range, (GT40, 330 P4, 300 SLR) - Lights and collectibility, especially GT40. 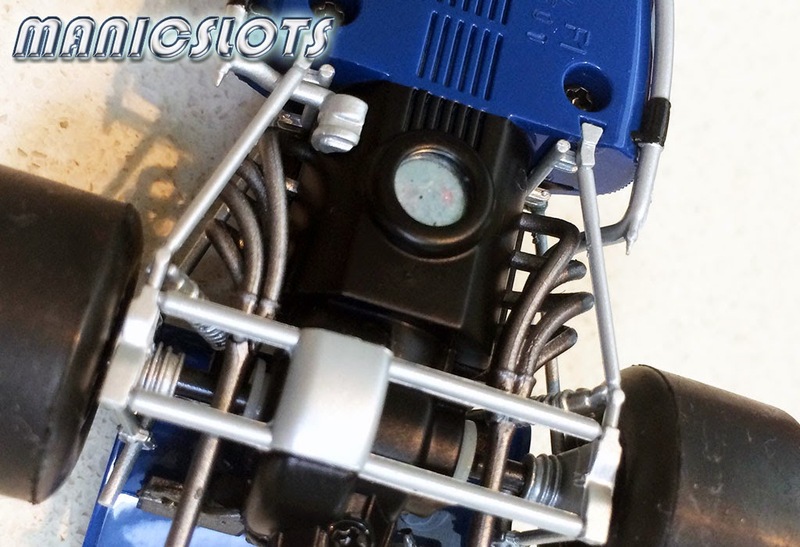 Scalextric Classic Grand Prix, (M23, 375, 312, 156) - Fun to race and limited collectibility. 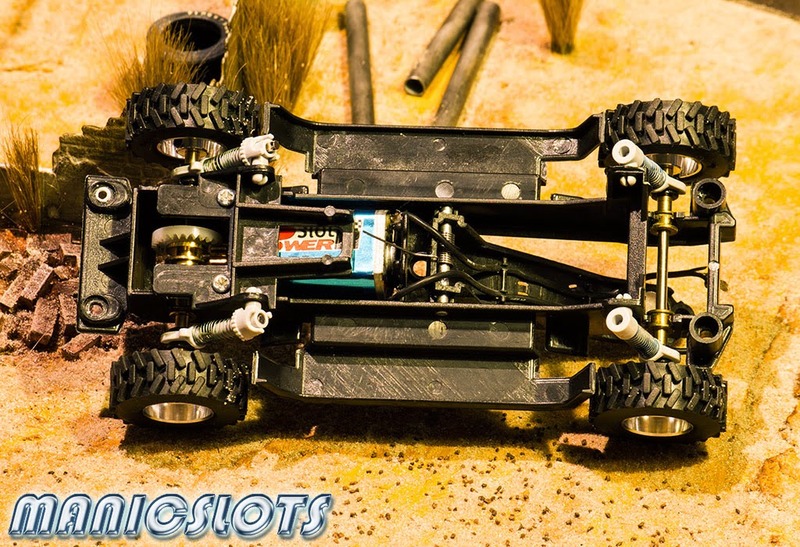 SCX Nascar Range - Blast to race, good chassis (floating pod), limited collectibility. Scalextric Endurance Range, (MC12, DBR9, GTR3, Audi R8) - Lights and great performance. 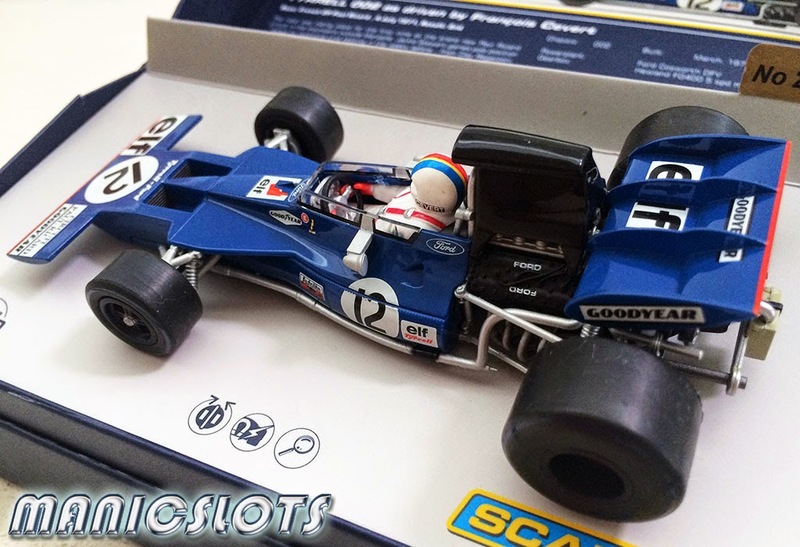 Slot.it Limited Edition Cars - Excellent engineering, very driveable and VERY collectible! 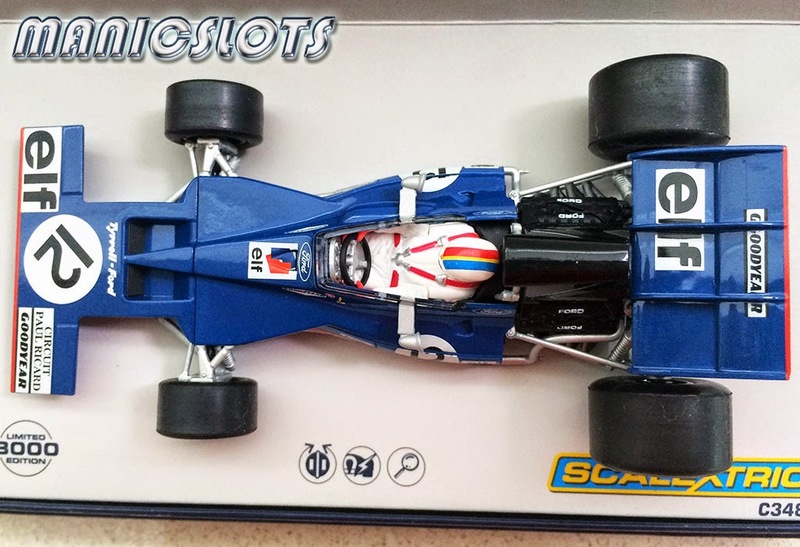 Scalextric Twin Box Sets, (Mercedes, Ferrari, Classic F1) - Collectible themed sets (harder to get for sub $100 these days). 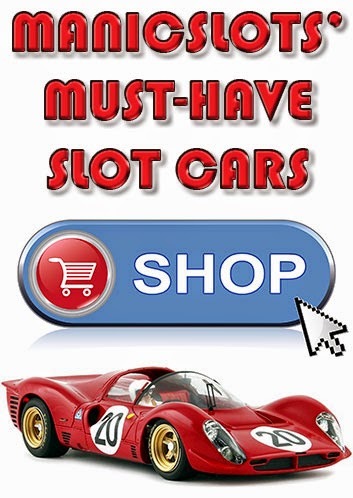 Slot.it Cars, (Mclaren, Porsche, Merc, Jag, Ferrari) - The 'drivers slot' and very collectible! 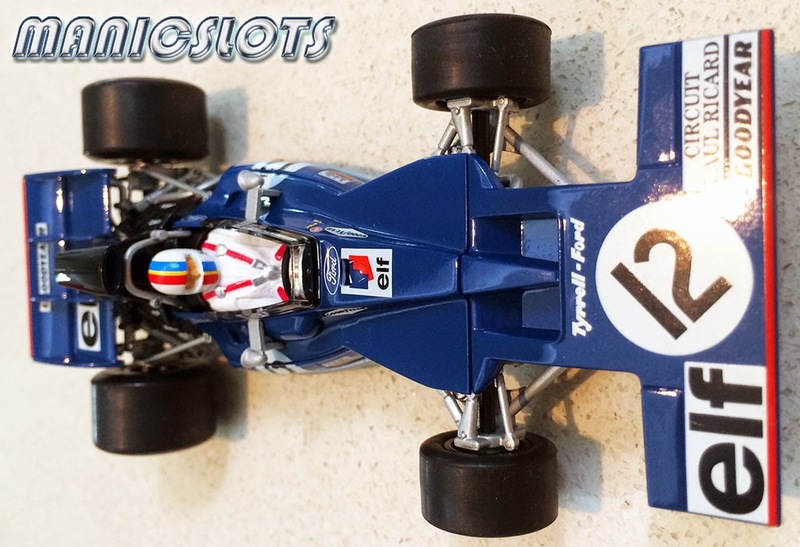 Fly Classic F1 Cars, (March 761, Williams FW07) - Unmatchable detail, great to drive and collectible. Pioneer Mustangs - Fantastic detail, great on the track with limited collection potential. 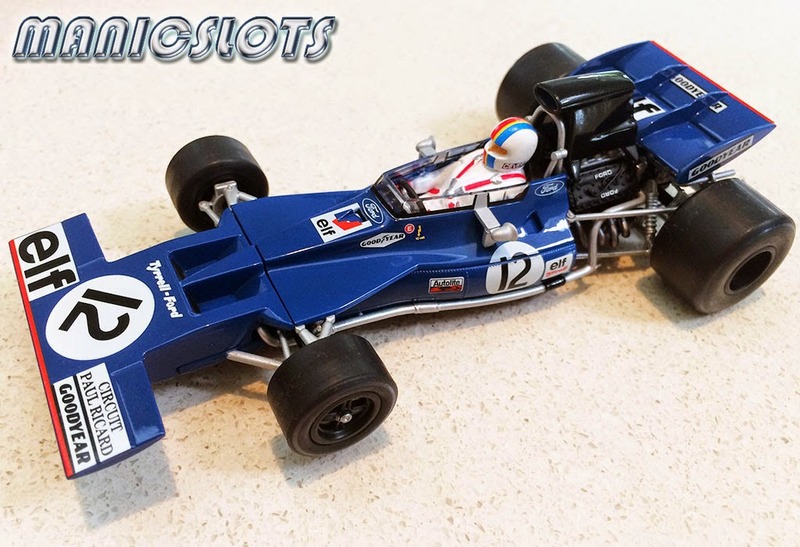 Slot.it LE Team Sets, (Porsche, Merc C9) - Excellent engineering, very driveable and VERY collectible! Fly Classic LE Cars, (March 761, Porsche 935, 917) - Unbeatable detail, highly collectible! 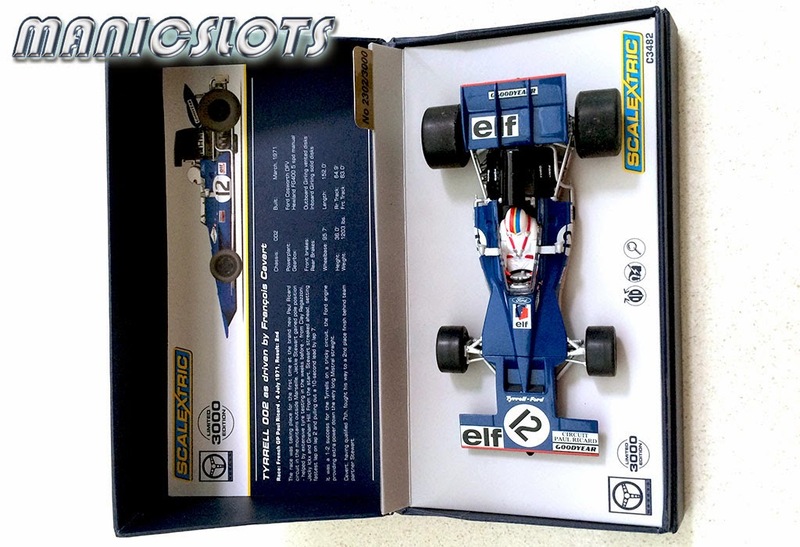 Fly LE Classic Team Box Sets, (Lola T70, Ferrari 512, Porsche 917K) - Unbeatable detail, highly collectible! NSR Classic, (Porsche 917K, Ford GT40 and P68) - Stunning engineering and finish. 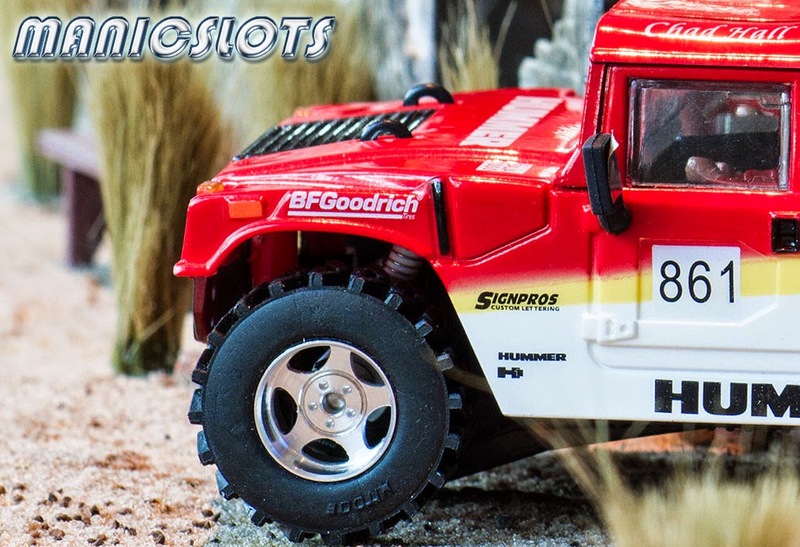 So you want to be a slot car collector? Well then, this is what you should be buying, (no order). 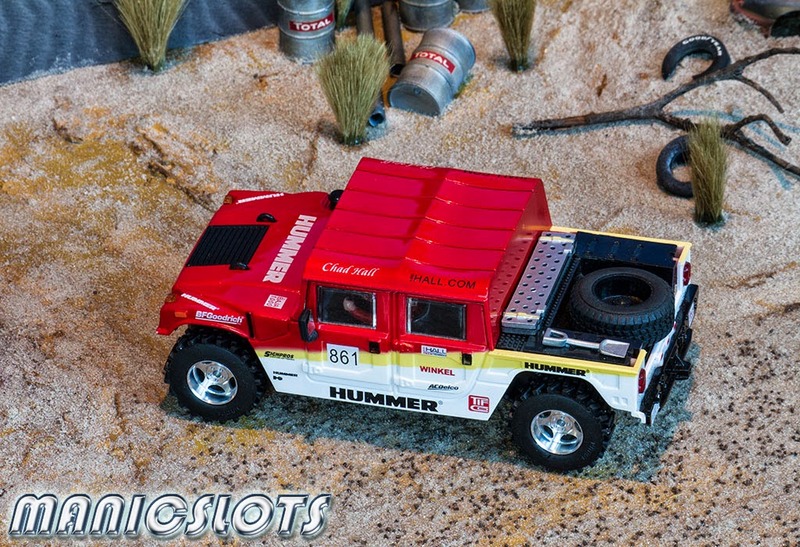 If I was to sum up Power Slot's Hummer H1 release it would be 'all show and no go'. 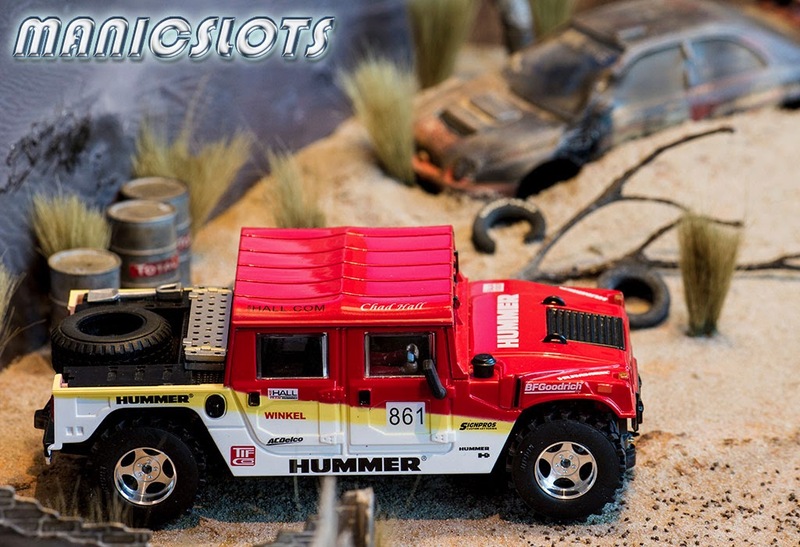 Power Slots 2007 release of the Hummer H1 in 1:32 scale caught the attention of many slot car fans, especially those into the RAID/rally scene. 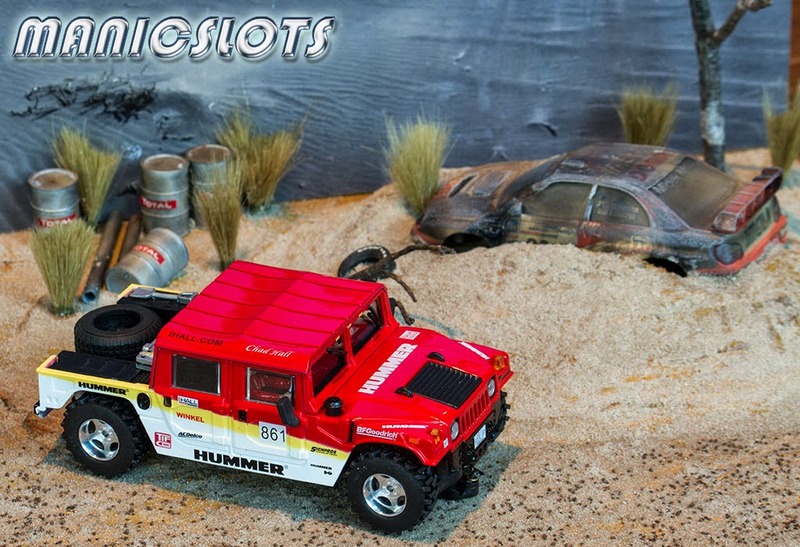 These days, a good H1 is getting harder and harder to come by, 2 years back I started to extend my RAID line-up and one of Power Slot's Hummers was a must have for me. If you've ever seen one in the flesh you'll know just how large and heavy these slots are. 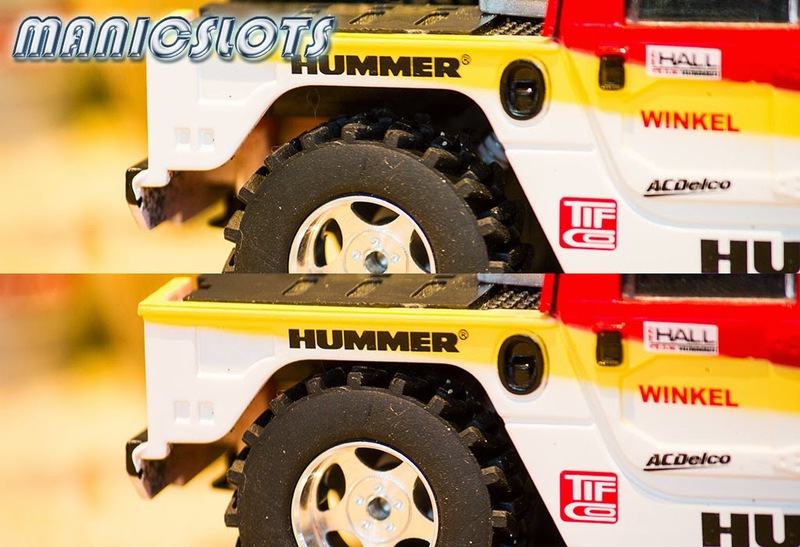 The H1 is over 80mm wide, 145mm long and ground clearance through the centre of the slot is over 10mm high! The Baja 1000 model featured here weighs in at 153 grams, the Lisboa-Dakar wagon H1 hits the 180 gram mark! By way of comparison, a contemporary Slot.it weights under 80 grams. 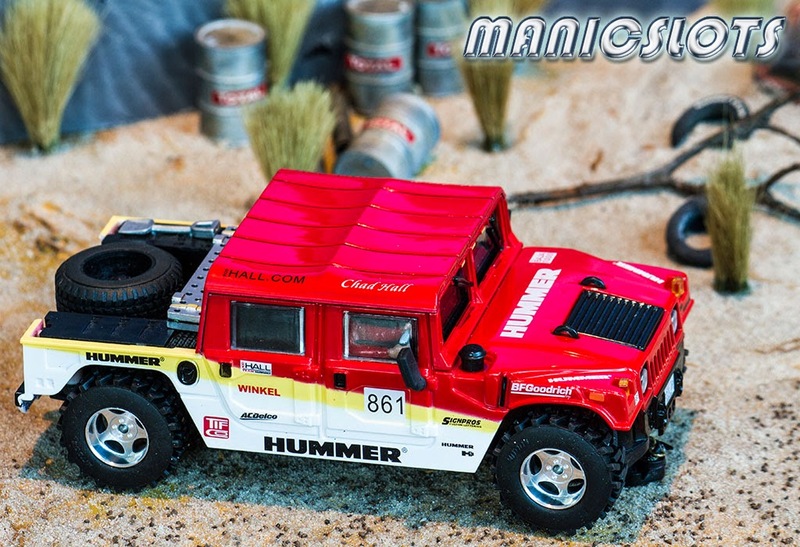 A couple of features on the H1 caught my eye straight off the bat, the H1 has a massive drop glide arm, she's 4WD (twin belt driven), all wheel suspension, massive ground clearance, rubber aerials, a high detail model and a very unique release. This from Wikipedia; 'The Hummer H1 is a civilian off-road vehicle based on the M998 Humvee, which was created by AM General. 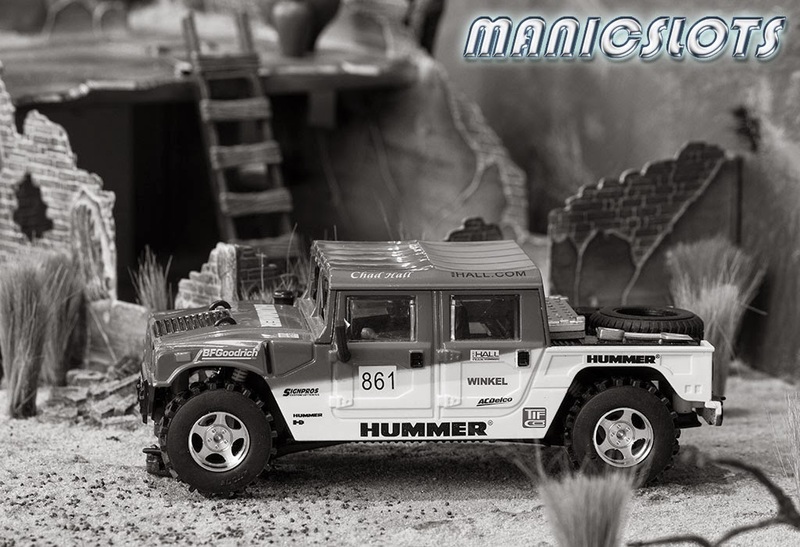 The vehicle was produced from 1992 through 2006, and was the first of what became the Hummer line. 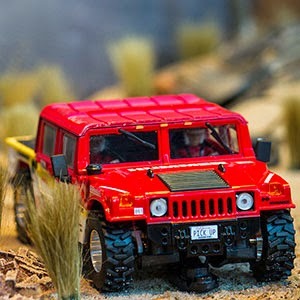 It was initially known only as the "Hummer"; however, in 1999 in a joint venture between General Motors and AM General, GM began marketing the Hummer H2, which was built on a heavily modified GMC 2500HD chassis. So the price, well with a slot like this you're going to be lucky to get much change from $US100 if you can find one. You'll get your little hands on it and you'll find all the features I've detailed above present, you'll smile as you remove it from its base and place it on your track and that's where the smiling will end. 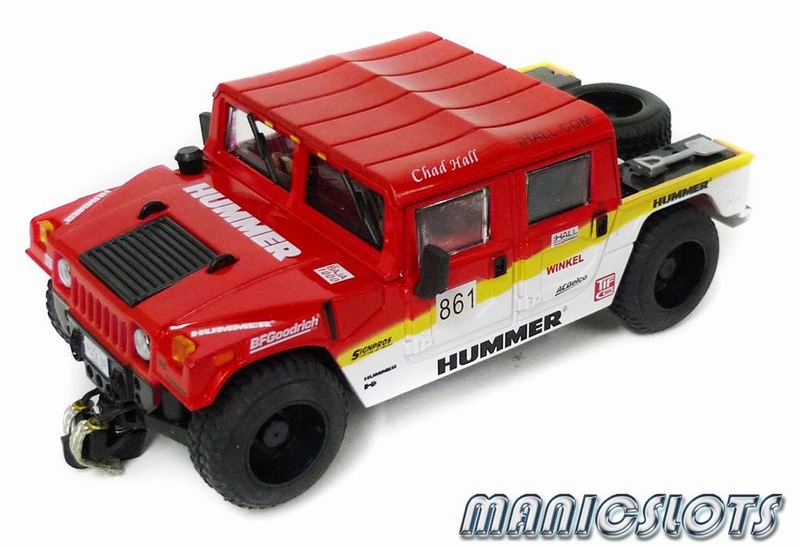 Now I'll point out that my H1 is one of the earlier releases and from what I've read, Power Slot made some improvements (particularly with the rubber) as later models were released. Let's be realistic, you have to expect that such a heavy and large slot will not be breaking your lap record but unfortunately the H1's problems are far greater than a high centre of gravity. 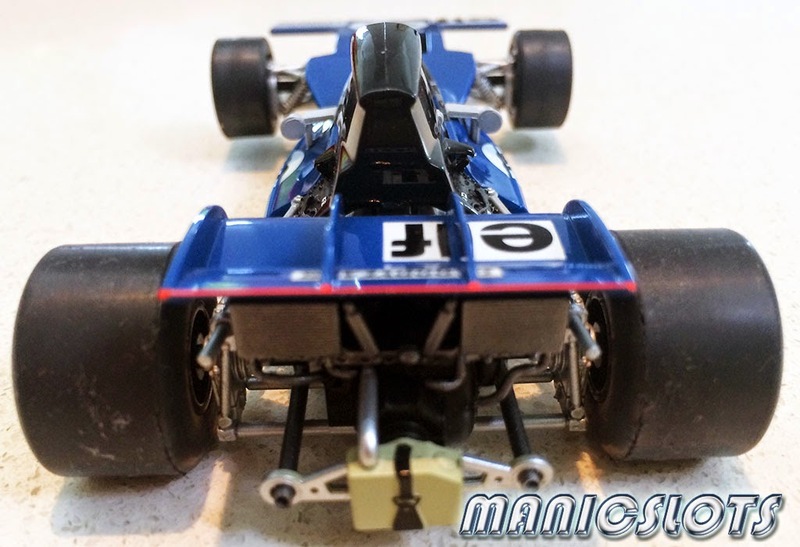 All wheels are seriously out of round, the rubber is so bad that it is impossible to 'true' and in my models case, the rear axle was seriously bent. 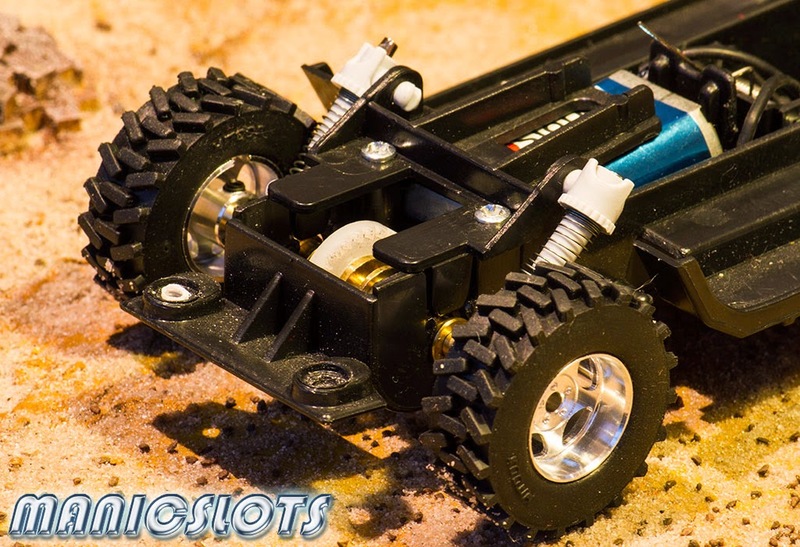 This slot moves down the track like three-legged dogs on roller skates! The saying 'shake, rattle and roll' seriously applies to the H1. What's worse is that the 4WD action and suspension are basically ineffective. The bands on the 4WD are too loose and there is nothing more than a millimetre or two of travel offered by the suspension. The combination of a high COG, heavy body and no magnetic chassis down-force, results in a car that's very difficult to drive around even the slightest corner at speed. 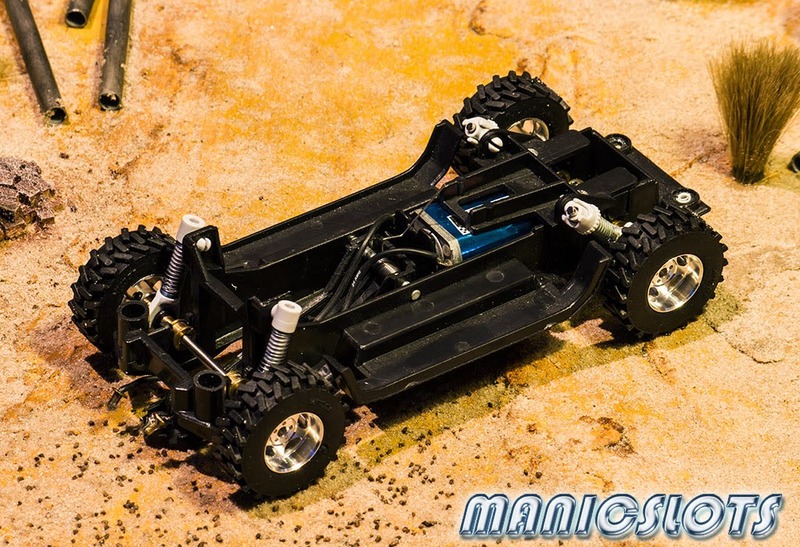 Typically I would just upgrade hubs/rubber and away I'd go but the H1's hubs and rubber are an unusual size, more like a Fly or Avant truck than a Ninco RAID car. All these factors resulted in putting my H1 back into its box and storing it in the cupboard out of sight for close to a year, till now. 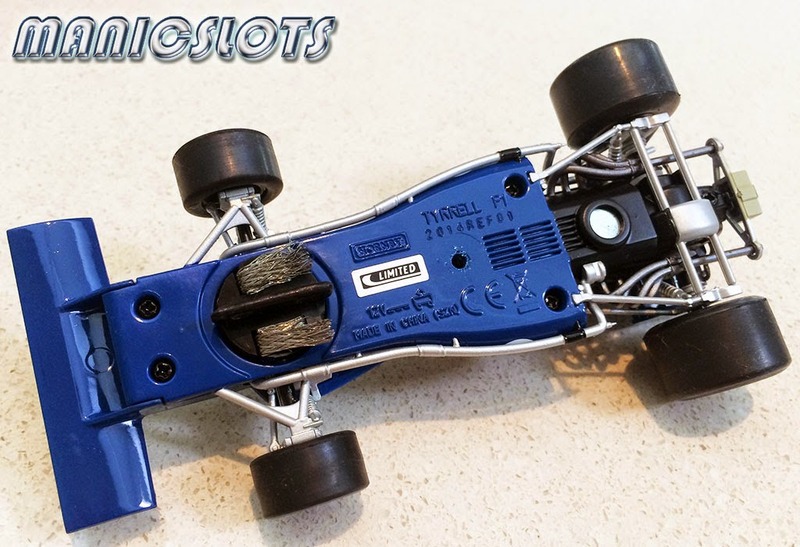 Recently I can across a company called Mitoos Racing Slot Lab out of Spain, they make an extensive range of high performance parts allowing you to upgrade and improve your slots performance. Ok I'll be honest, I'm a sucker for their knobbly truck tyres and wondered if they would be a suitable match for my H1. A few hours research on the net resulted in the ordering of some Mitoos M028 Raid hubs and MO17 Raid Traction rubber. I also needed to upgrade the axles and the standard Power Slot glide is sorely inadequate for a slot of such magnitude. 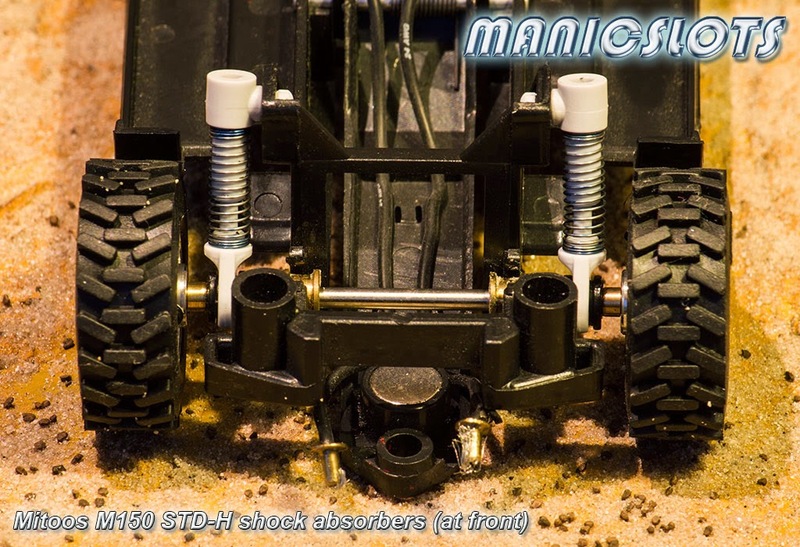 While I was at it, I noticed that Mitoos also manufacture suspension for the H1, a full set was a must if my beast was to perform to its full potential on the track. A patient wait for my parts followed by 20 minutes of component replacement and I was ready to test my Mitoos upgraded H1. 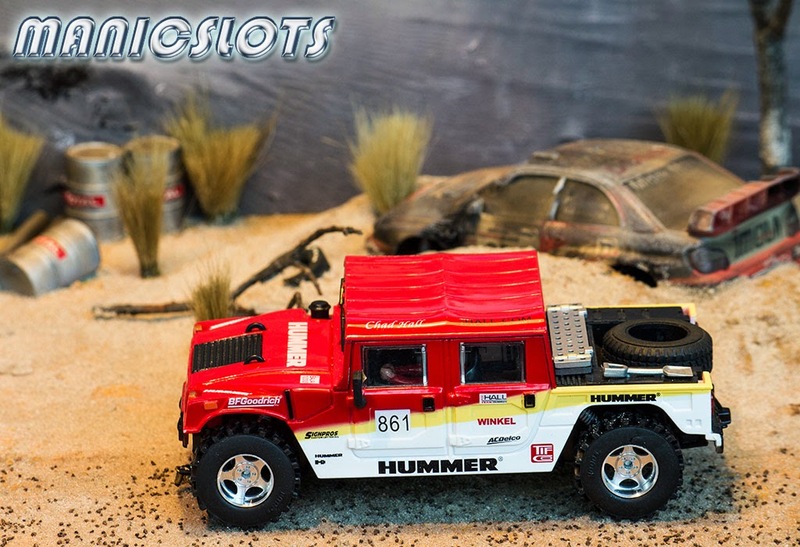 Well as you might expect, track performance, handling and physics improvements are a welcome improvement, gone is the 'Hummer Hop' my H1 experienced as it lumbered down the track. The H1 is far more manageable to drive and an added bonus to she also runs much quieter around the track. Now lets talk about the improvements to aesthetics, the new hub/rubber combo looks wicked, hopefully the photos do the new look H1 justice. At first I thought I'd prime and spray the hubs a mat black but I'll be leaving the chrome as is, for now anyway. The suspension upgrade worked a dream, my H1 now has active suspension that actually works. 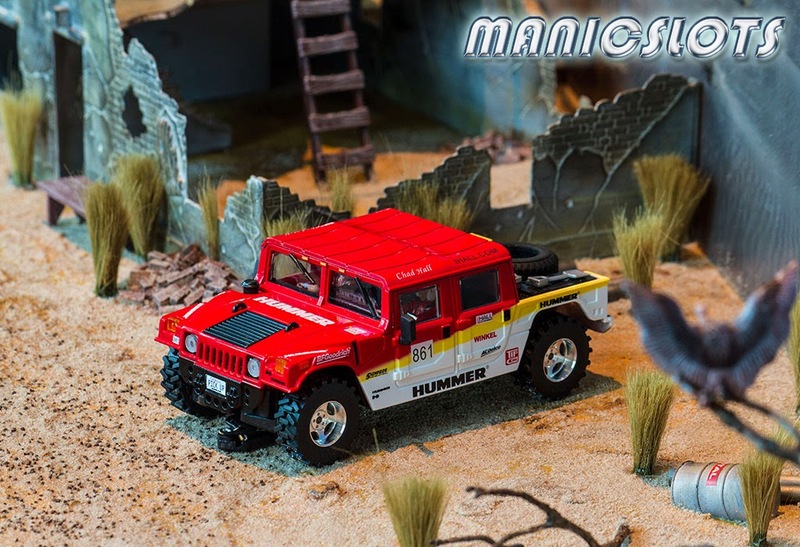 Mitoos offers a few options for the Hummer and I installed the 3-way adjustable (soft, medium and hard) M163 Pro shocks at the rear and M150 standard non-adjustable shocks in the front end due to reduced clearance to the bonnet. The photos below will give you an idea of how well they work. The upgrade glide was a must and helps to keep the beast in the slot when cornering, hot glueing the motor is also a good move. 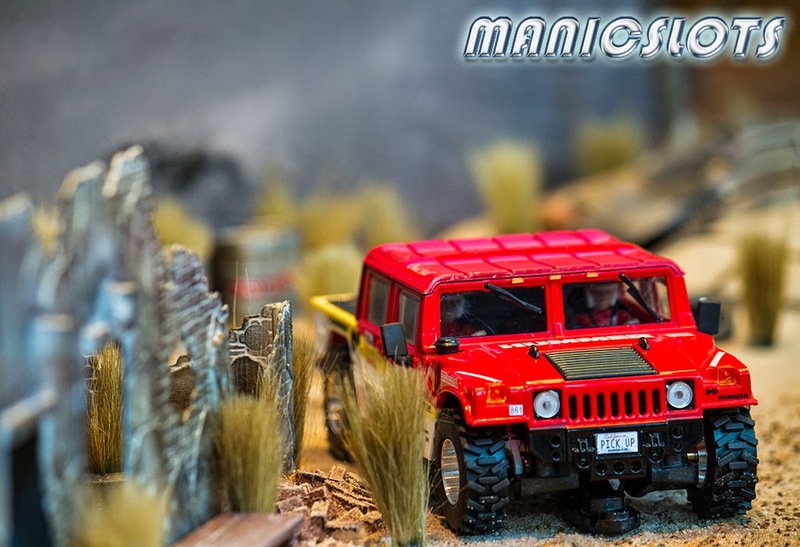 I decide to remove the 4WD system as it offers very little to the H1's off road capabilities, I may acquire some after market 4WD components at a later date and reinstall the 4WD function to the H1. 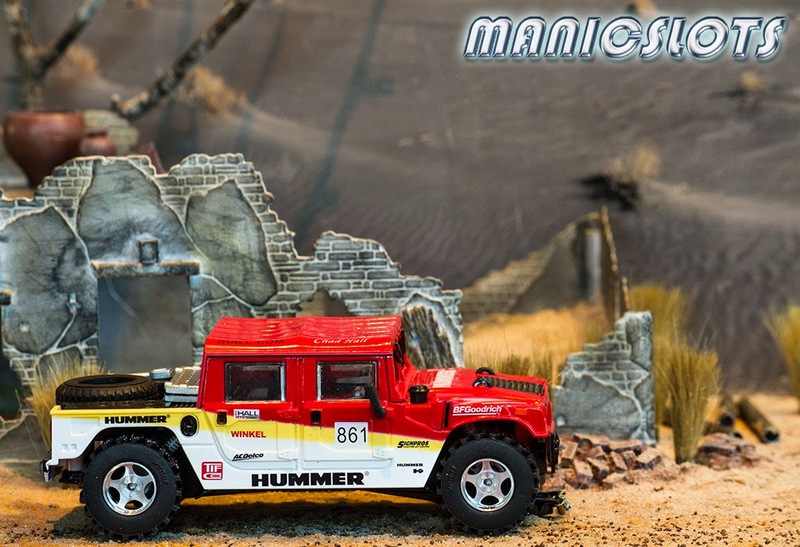 The only other element I may have to change in the future would be the spare wheel/rubber at the rear of the H1, really to create the full effect this needs to match the fantastic look of the Mitoos hubs and knobbly rubber tyres. The H1 is always going to be a hand-full on the track but now its smooth, more manageable and stunning to drive. 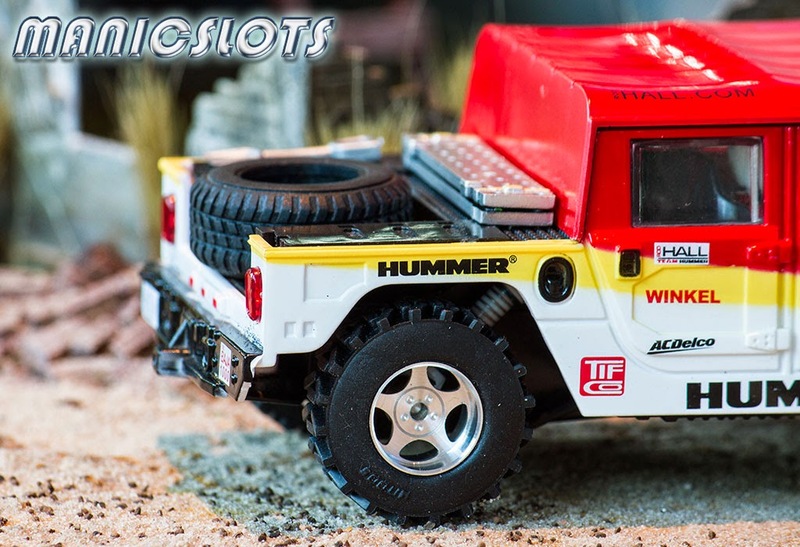 For every 25 slot cars I purchase I find that one of them has something unexpected that makes you want to run it for thousands of laps, the Power Slot Hummer is one of those slots...you just have to work a little harder to unearth the potential. 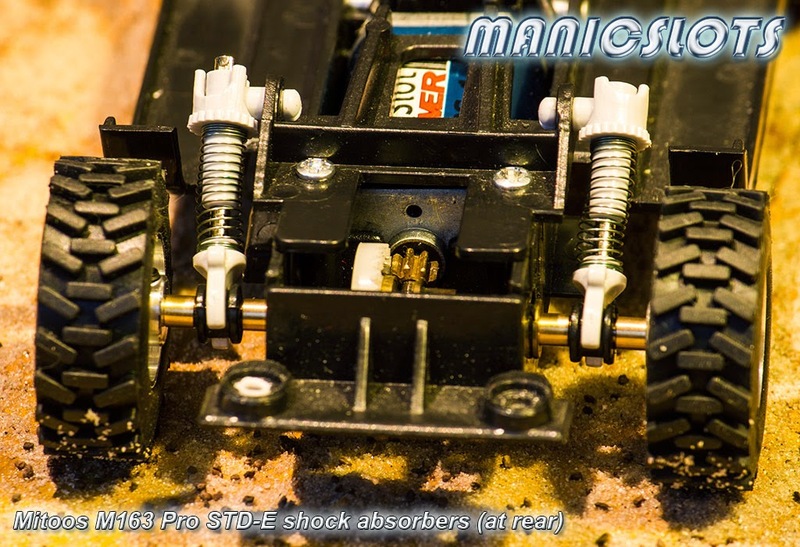 Find this useful, check-out ManicSlot's How-to page by clicking the below link for more useful slotting tips and tricks. 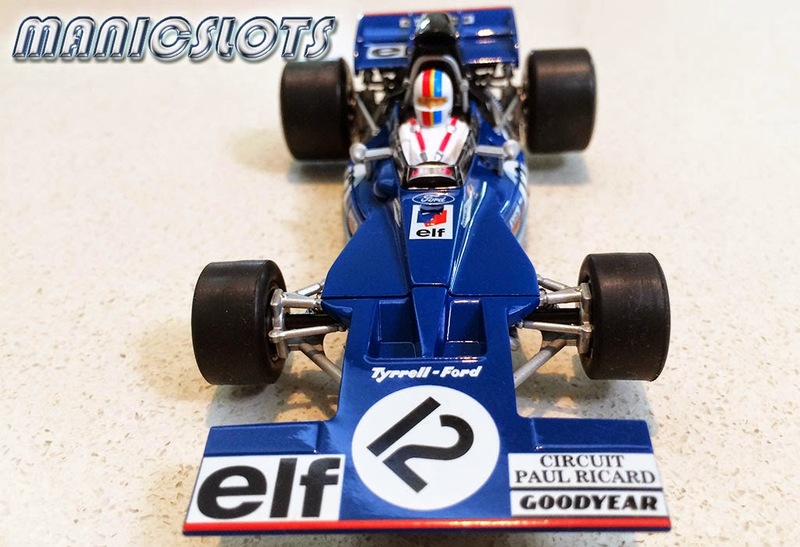 The Tyrrell 002 makes for another stunning classic F1 release from Scalextric in their newly introduced 'Legends' range. Presentation on the track is fantastic, Scalextric have put a lot of effort into capturing the detail and their efforts are appreciated. 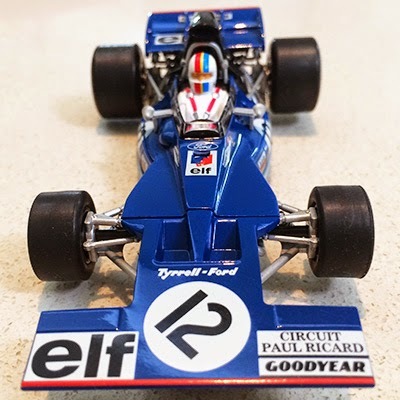 The large intakes in the front wing make the car look particularly unique and the blue elf livery looks great on the track. Performance is also very pleasing with my model turning some fast and competitive laps straight from the box. 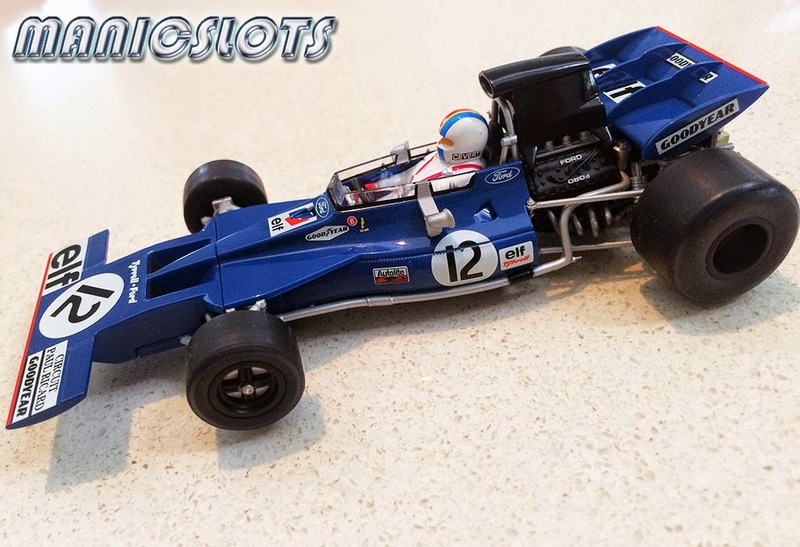 You'll be happy to know that Scalextric have fitted the Tyrrell with their small button magnet (just forward of the rear axle - see below photo) allowing the slot to drift at time when pushed through corners. I must apologise for the quality of the photography, my 7D is on the blink so these have been taken with my iPhone. :) The Tyrrell is limited to just 3000 units, availability will be short term so make sure you secure one if you have the means. 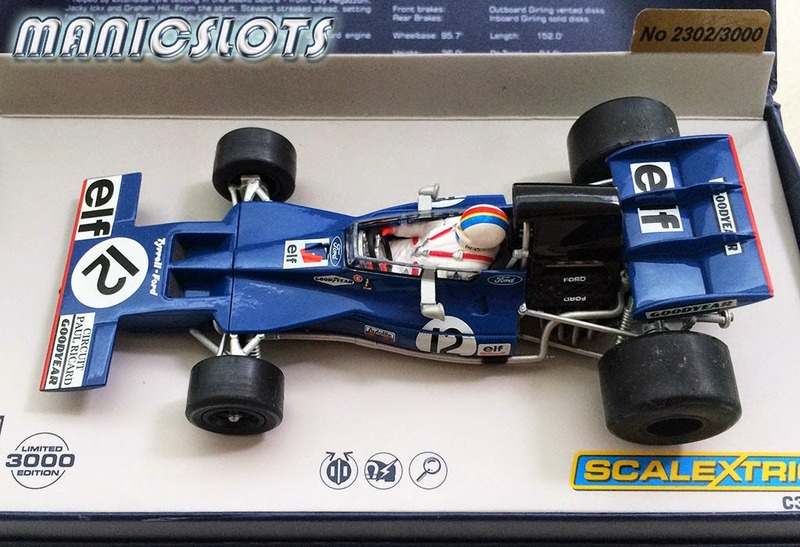 From Scalextric: 'The 1971 French Grand Prix took place for the first time at the brand new Paul Ricard circuit in the mountains outside Marseille. Jackie Stewart gained pole position from Clay Regazzoni, Jacky Ickx and Graham Hill. 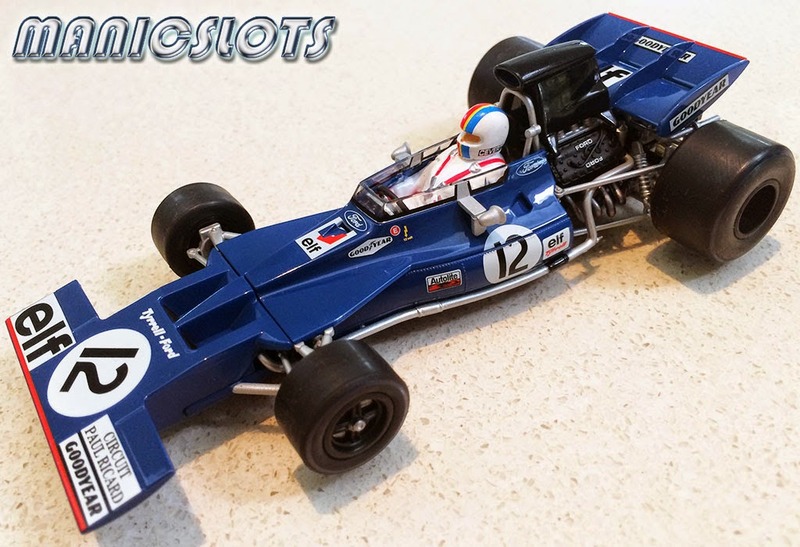 Want to find out more about Scalextric slot cars? Here you'll find links to the 20 most recently published ManicSlot's Galleries - enjoy! Click on the above gallery button for the complete ManisSlots' Gallery page. Sideways SWLE02 Porsche 935 Chrome Ltd.